It doesn't have to be all about bacon and cheese. Although quiche Lorraine remains a classic, there are countless ways to be inventive with a basic quiche recipe. Try a few novel flavour variations and avoid a few pitfalls to ensure you create the perfect lunch dish to accompany a tangy salad. First, grab some eggs . . . The basics of a quiche recipe are taught in school cookery classes, but it's worth a little reiteration. Use a blind-baked shortcrust pastry filled with a custard of eggs, cream and milk with seasoning. This is baked for around 30-40 minutes until the filling is set. Timings will vary depending on the ingredients of the quiche. Having mastered the basics, it's time to consider some taste combinations. The classic Lorraine recipe adds cheese and bacon, but why not give it a slight Spanish makeover with a little chorizo, Manchego cheese and a delicate dusting of pimenton? In summer, a delicate salmon and asparagus quiche looks pretty in pink and green. Flavour with just a hint of nutmeg and a touch of black pepper. 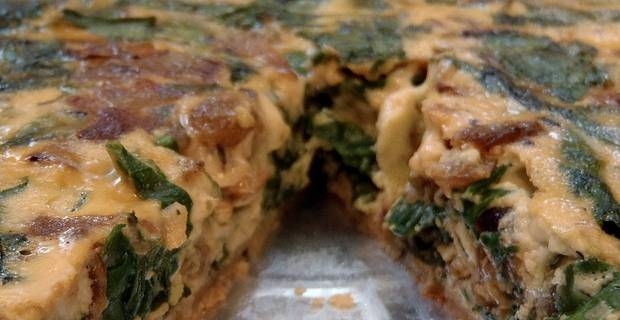 Onion and Swiss chard make a brilliant team for a vegetarian quiche, the sweetness of caramelised onion complementing the rich bitterness of the chard. A rocket and tomato salad is the perfect accompaniment. A mushroom and tarragon quiche is also ideal for those who avoid meat. The mushrooms should be fried for a few minutes before adding to the quiche mixture, to get rid of excess liquid. An assortment of wild mushrooms will give a more interesting result. There are a few things that can go wrong with any quiche recipe. Be careful with ingredients like tomato that can shed a lot of liquid during cooking. The health-conscious may be tempted to use skimmed milk in their custard, but the results will be thin and disappointing. Beware of over-baking. This can cause the custard to separate.